It was great. I had no problem with her, she listened to my concerns. I felt vey comfortable with her thewhole time. It was great. I had no problem with her, she listened to my concerns. I felt vey comfortable with her the whole time. Dr Lott answered all my questions and listened to my comments before she recommended treatment accordingly. It is a relief!,believe it or not is becoming rare to have a doctor listen, understand and educate their patients with patience and deep regard. I'm glad she did just so. I'll be coming back for sure! Dr Lott answered all my questions and listened to my comments before she recommended treatment accordingly. It is a relief!, believe it or not is becoming rare to have a doctorlisten, understand and educate their patients with patience and deep regard. I'm glad she did just so. I'll be coming back for sure! Thank you for scheduling your appointment with our office. New patients are required to arrive 30 minutes prior to appointment to complete registration. If you were unable to provide any insurance information at the time of scheduling, please contact our office with your insurance details prior to your appointment. If we do not hear from you, your account will be considered self-pay and any charges will be due in full at the time of service. *Dr. Lott only sees patients age 13 and up. 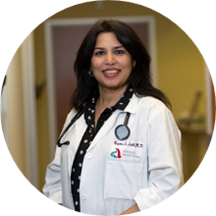 * Practicing at West Olive Family Medicine, Dr. Nagma Lott serves the community of Glendale, AZ. Dr. Lott is a concerned family physician who completed his fellowship in geriatric medicine and residency in family medicine at Emory University. Before completing her training, Dr. Lott attended Jawaharlal Nehru Medical College, where she received her medical degree. Dr. Lott is certified in geriatric medicine by the American Board of Family Medicine. She is a knowledgeable physician and is a part of prestigious organizations like the American Academy of Family Physicians, the American Medical Association, the Georgia Academy of Family Physicians, and the American Geriatrics Society. Dr. Nagma Lott is committed to providing quality patient care. She offers assistance on general health and wellness to all her patients. I love her and all the providers and staff in this office! Truly amazing. I really appreciate the time she take to explain everything to you in detail. Dr. Lott is a very caring and thorough individual. I am happy to have her for my Primary Care physician. She is very nice and helpful.